Menlo Park, California-June 23, 2017-WeVideo, a Microsoft Education Partner, today announced that its award-winning, cloud-based, collaborative video editing application is available immediately as part of the new Microsoft Windows experience for K-12 classrooms. 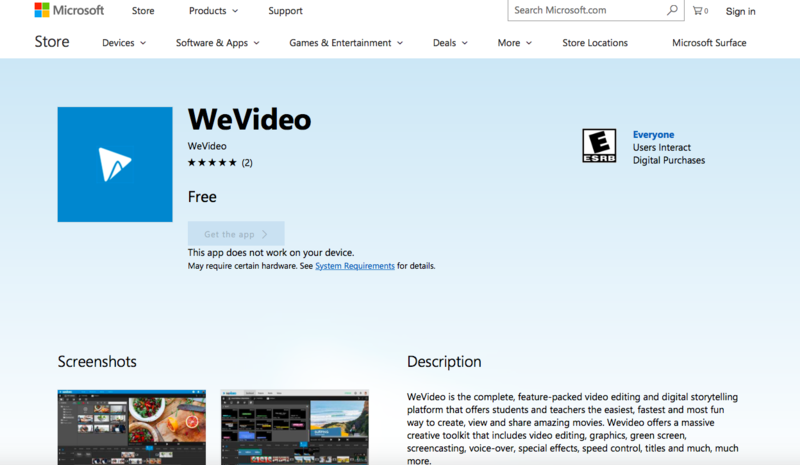 WeVideo was selected by Microsoft as an early participant in the new Education Apps Store. The two companies plan to showcase the new WeVideo Windows app through demonstrations at the ISTE Conference & Expo 2017 in San Antonio, June 25-28, in the Microsoft partner booth (#1140) as well as the WeVideo booth (#3045). WeVideo provides students and teachers with an extensive creative toolset that includes video editing, graphics, green screen, screencasting, voice-over, special effects, speed control, motion titles and more making it perfect for any project and subject area. Read the complete description at https://www.microsoft.com/en-us/store/p/wevideo/9mt7x2km8zsg. Easy-to-use themes, included music, and more always make starting a project a breeze. Deep Office 365 integration ensures privacy, security and makes it easy for administrators to provision and manage users, groups, schools and districts when using the WeVideo for Schools product. "We are excited to partner with WeVideo and bring these digital storytelling experiences to the Windows platform. With WeVideo, students around the globe have access to an extensive creative toolset coupled with deep Office 365 integration to assist with privacy, security and provisioning," said Anthony Salcito, VP of Education Microsoft. WeVideo CEO Krishna Menon said, "WeVideo is very pleased to be part of the new Microsoft education experience and strongly supports its goals of making high quality creative tools for learning and collaboration widely available to students. This partnership is an important step toward our mission of putting advanced video editing and digital storytelling tools in the hands of students and teachers everywhere. We'll soon be adding even more new powerful features that take advantage of the unique capabilities of the Windows environment to deliver the ultimate Windows video creation experience." To be accepted as one of the premier entrants to the new Microsoft Education Apps Store, the WeVideo web app was vetted and verified by Microsoft for quality and security. The new dedicated Education App Store was designed to provide a safe experience for students and teachers. WeVideo is fully compatible with existing Windows 10 devices as well as the new Windows 10 S-the new Windows experience designed especially for schools-and works with the new generation of powerful, affordable devices being made available by Microsoft to schools from top hardware partners such as Acer, ASUS, Dell, Fujitsu, HP, Samsung and Toshiba. WeVideo is a powerful, easy to use, cloud-based video creation platform that is the digital editing and storytelling choice of more than 22 million consumers, students, businesses, and third-party media solutions. WeVideo is available from virtually any computer or device at home, school, work or on the go to capture, edit, view and share videos. Built for the future in HTML5, WeVideo brings maximum speed, responsiveness, security and expandability to browser-based video editing. 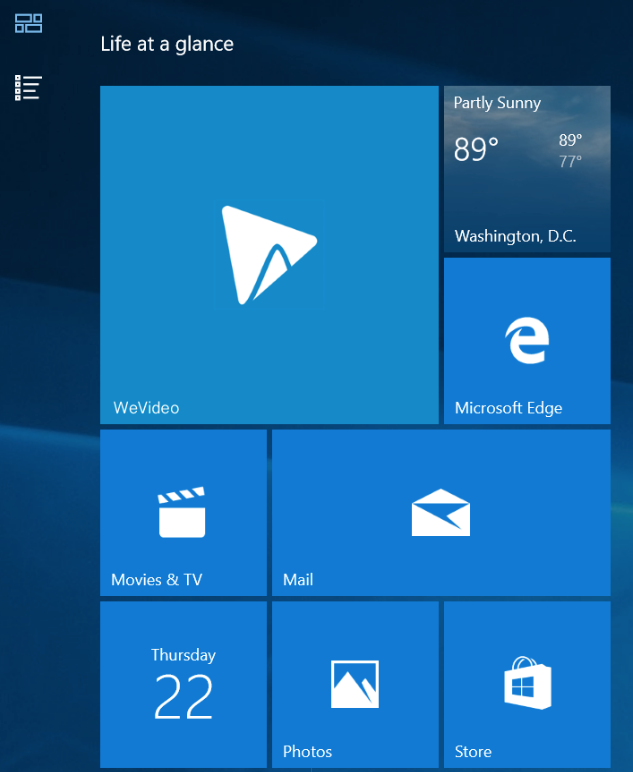 WeVideo offers a special version of its app that is exclusive to the Microsoft App Store. WeVideo is a Google Play Editors' Choice selection with more than 7.5 million downloads to date. WeVideo is also the exclusive digital storytelling solution of Google's Education Creative Bundle for Chromebooks and a Microsoft Education Partner. More than 6,500 schools use WeVideo to enhance classroom learning. For more information and to try WeVideo yourself, please visit www.wevideo.com. Stay up to date by following us on Twitter at @wevideo or visit us on Facebook at www.facebook.com/wevideo.